NES Circus Charlie (JPN) in 03:23.51 by TheRealThingy & Randil. 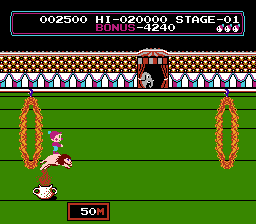 Circus Charlie is a simple game that most people probably know from pirate multigame carts. The first stages are easy for anyone even on real NES, but stage 3 is already quite challenging. This movie plays "1 player game A" (easy). Ironically, this is MORE challenging for tool-assisted gameplay. Stage times: 3440, 3560, 3750, 3880, 4280. Yet another "perfect" movie beaten. This time by 12 frames. The currently fastest "game B" (hard) TAS can be found here.